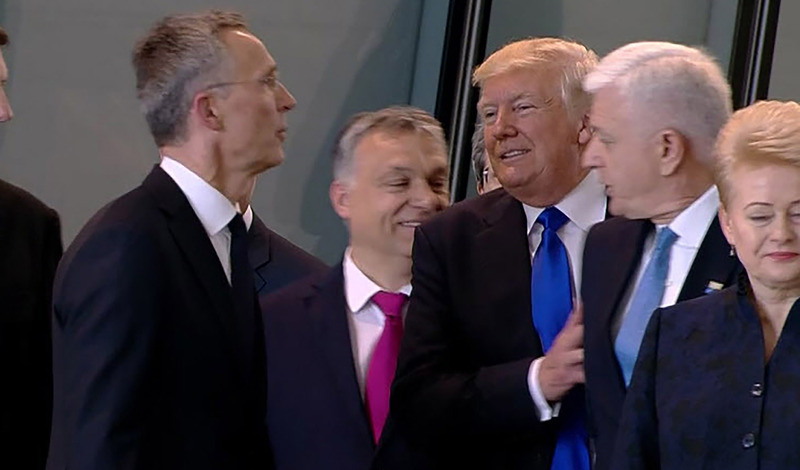 TRUMP clears Montenegro Prime Minister Dusko Markovic out of his way for a front line position in a photo shoot. Geopolitical systems are breaking down. It is the New World Disorder. Globalization is in retreat, alliances are crumbling, relationships shifting with the speed of a shove to a world leader. The established alignment of nations has in short order been rendered “incohered:” disassembled, fragmented, and falling apart. Steve Bannon’s “deconstruction of the administrative state” is in process, meaning the system of taxes, regulations, and international agreements that are “impeding American nationalism” are being swept out of the way. The post-World War II political and economic consensus is flailing, replaced by a state of international chaos that Bannon believes will empower “ordinary people” over coastal and international elites. The breakdown is swiftly underway as TRUMP returns to his White House bunker amidst an administration in flames: a scenario worthy of Wotan’s denouement in the grand post-apocalyptic finale of Wagner’s Götterdämmerung. Global disorder is the grand motif, the prevailing theme, an epic, indeterminate political strategy to bring it all down into a crashing chaos of crumbling institutional disruption. TRUMP’s New World Disorder is revolution of the highest magnitude, played out on the world stage, a geo-mashup and disruption of convention, democracy, and humanity. The escalating plotline of TRUMP’s presidency has been brilliantly non-scripted to leave behind only a disintegrating trace of memes and unrecognizable cultural artifacts, which loop endlessly in the resonant noise of the social/media echo chamber. This anarchic intervention is of such scope and magnitude, that it suggests a war of a different kind, a new brand of attack, not in the form of missiles, but rather the deliberate upending of democratic norms and stable relations among nations. As TRUMP turns a friendly eye to despots, dictators, and strongmen, he casts a suspicious cloud over friends and allies, instead choosing to traffic in backroom deals with Russian spies and oligarchs. Welcome to the new world disorder: the alt-right social and political deconstruction of reality.